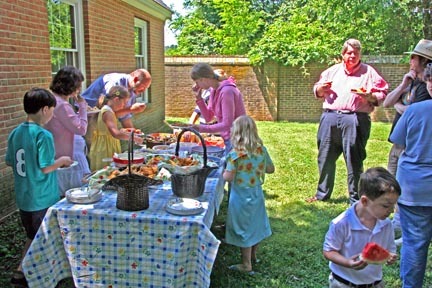 We have been blessed with many hospitality offerings throughout the year. We sincerely thank all friends who have provided both food and generous effort on First Days and for special occasions—most notably for: Southern Quarter Potluck January 20th, 2008, Moving Up Day, June 1st, for our First Day students, Cassie Thompson and Sam Mullen, Hospitality for the Carriage Shed Sale, September 27th, the Christmas potluck, December 21st, and Hospitality for the Winter Shelter Project, February 2009. We also warmly thank those who help out with hospitality for each Memorial Service held at Third Haven, whether it is for our own members or for guests. It is helpful to schedule hospitality providers in advance. The program of sign-up, assigning one committee per month to be primarily responsible for hospitality for their assigned month continues to have mixed results. It seems that the same people end up doing Hospitality most of the time. Since there are 12 committees at Third Haven, each month is a different committee's responsibility. A list of committee assignments is posted on the refrigerator in the Common Room. We encourage clerks of the committees to consult the list and to remind their committee members when it is their turn. It is not necessary to cover each First Day, but it can be fun to do a potluck as a committee one Sunday out of that month. Or, if individuals from the committee wish to sign-up alone, that is also welcome. This past year, a new list, involving Hospitality Committee members only, has been posted on the refrigerator, which is to ensure that at least coffee is always available on First Days. If the person posted is not free to prepare the coffee, someone else on the committee is contacted to fill in. As a committee, we now have the following members: Peter Howell, Emma Leibman, Beth Mufson, Jacob Mullen, Heidi Wetzel, Ann Womack, and Ralph Young. We have managed to stay within our annual budget of $400 and project similar activities, as well as a similar budget, for the next year. We still encourage ALL members and attenders to participate in this wonderful program at Third Haven. Reach out—it is a delight to work with one another.